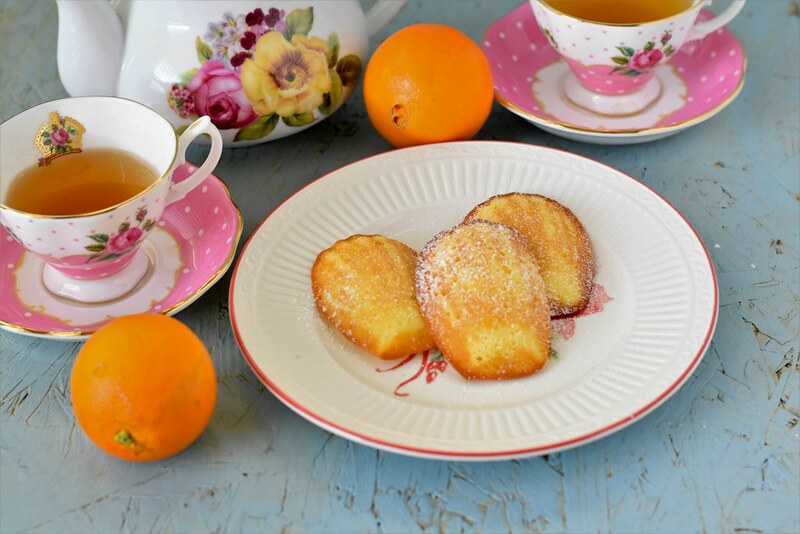 There is a proverb that Happiness comes in small packages; this orange madeleines recipe is one of that kind. I wanted to buy the madeleine pan for some 5 long years now. Finally, I bought it, and started searching for a perfect recipe for orange madeline. I was really baffled by a large variety of it, so ended up making my orange madeleines with its specific twist. Madeleines are small soft sponge cake with a distinctive shell-like shape acquired from being baked in pans with shell-shaped depressions. This dish is from Commercy and Liverdun, two communes of the Lorraine region in northeastern France. Trust me these are little wonders that you can eat with cup of favorite tea or coffee. I wanted fresh orange juice and zest in orange madeleines. So, didn’t added any vanilla extract. Really simple recipe with eggs, flour, orange juice, zest and sugar. I didn’t add any glaze, simply dusted with powdered sugar. You can eat them as such without any powdered sugar too. You can make vegan or gluten free madeleines, I wanted to try traditional route so made this one with eggs and flour. These tender and soft tea cakes make your dessert table wonderful. That is why madeleines became iconic by famed French novelist, Marcel Proust through his novels. “It was a mouthful of miniature sponge-cake dipped in tea” that became one of French literature’s most powerful metaphors. These orange madeleines are important to me, because it is one of the recipe I wanted to try for long time and finally passed with flying colors. My hubby always mentions that for food the taste is the king, if you got that then you did right. These orange madeleines are good, I think you can make it plain or with any other citrus, I like this orange version, I will try lemon and blood orange also. You know food blogger mind is always thinking of recipes when it see’s fruits or veggies. Delicious orange Madeleines made with fresh orange juice, orange zest fully of ctirusy flavor. In a large bowl, whisk together the sugar and eggs. Then add orange juice and zest and mix well. In a separate bowl add flour, baking powder, and salt. Whisk well. Add flour mixture to egg mixture and mix well to this add melted butter and mix once again. Then cover and refrigerate the dough for at least 1 hour or overnight it you want. When you ready to bake pre-heat oven to 350F and brush the madeleine pan with butter you can use soft butter, I used melted butter. Add small cookie scoop batter into each pan and bake it for about 8-10 minutes or until the sides are crisped up and the cake has cook through. Serve as it is, or with a dusting of powdered sugar. Enjoy! I’ve been meaning to buy a madeleine pan for a long time as well, and I think this recipe is convincing me to finally get one! My daughter loves madeleine cookies. The orange flavor sounds soooo good for these! I love orange flavor you added here, Swathi! I enjoyed watching the video too! On my to do list! I have never made madeleines. I think they are just so pretty….and now I have a great excuse to but some new baking pans right?? Madeleines are my moms favorite kind of cookies and she loves orange desserts so this recipe is perfect for her. I’m going to send her your recipe. Thanks for sharing! I have not made mandeleines in years. When my kids were babies they loved eating these. Love the flavor of orange in there. Such an easy recipe. Your orange madeleines look so soft and fluffy. Lovely recipe. these look almost too pretty to eat! I love that you brightened them up with orange. I got a madeleine pan only a few months ago, and have only used it a little bit. 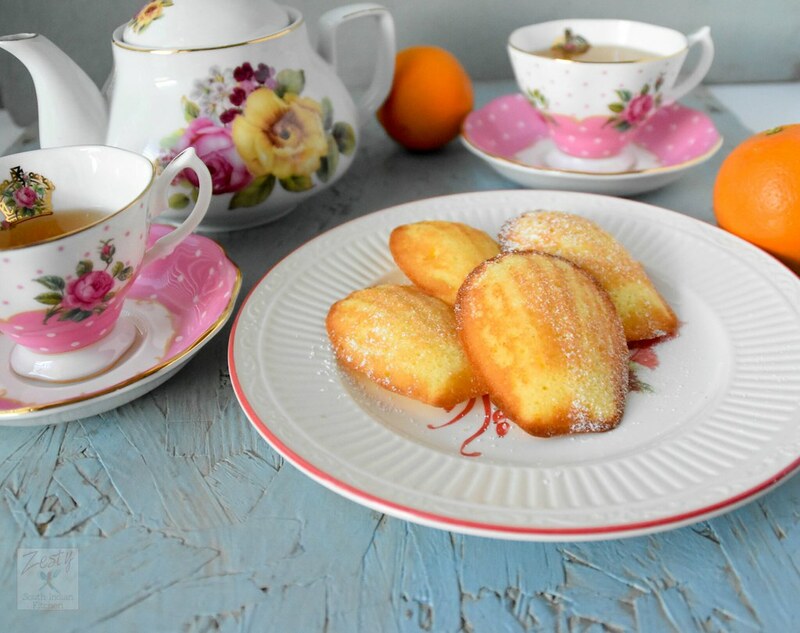 I LOVE trying new recipes, and orange madeleines will be perfect when I host a tea soon! Homemade madeleines are best. Orange flavor makes it more interesting. looks so delicious. Such an elegant and dainty cookie. I’ve often been tempted to purchase a Madeleine pan. Now, with you flavoring the cookies with orange — I love citrus flavor — I’m succumbing to the temptation. I could imagine enjoying one or two with a cup of coffee. 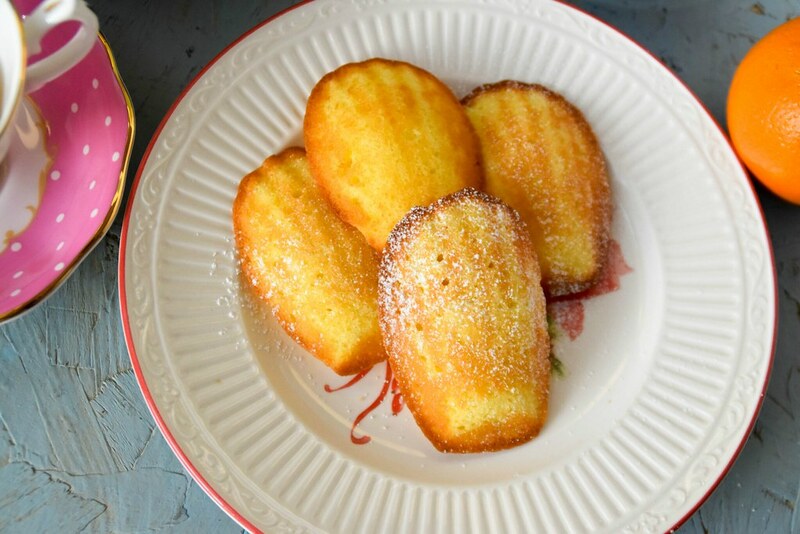 I have always wanted to make madeleines. It’s one of those that I thought would be too difficult. I’ll have to give this a try! Oh these look so yummy and filled with citrus flavors! I;d love to try this recipe soon and bookmarking it right away. These look so pretty and delicious. I’ve been wanting a lot of citrus lately because they are in season. 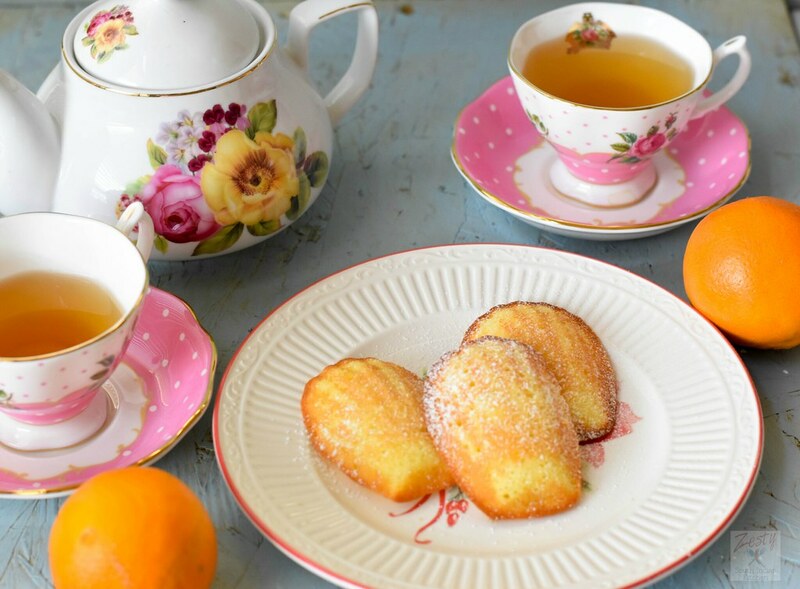 I am currently having tea as I write this and wishing I had one of the orange Madeleines now. I am pinning this for later. These cookies are so beautiful! I will definitely add these to my weekend baking list. Your post prompted me to check and buy this Madeleine mold on Amazon asap. Wahahah, that’s how compulsive buyer I am.. Thanks for this delectable recipe. Madeleine are my family favorite! We always get then from Costco .. but after seeing you well explained Recipe I guess I will give it a try love the infusion of orange in it too! These look gorgeous! They are definitely going to make an appearance at my next tea party!